Colesden Lodge Farm is owned by David and Sarah Tutt, who both come from long established farming families and who are passionate about farming and in particular 'Ruby Red' cattle. They have painstakingly reared a fine herd of these magnificent animals on their 380 acre farm in the Bedfordshire countryside for the sole purpose of providing exceptional quality beef to you the customer. They have a wonderful farm situated on the top of a hill and surrounded by a mixture of cereals and Italian rye grass, which they supply to pedigree horse breeders at Newmarket, Cambridgeshire and also provides permanent pasture for their Ruby Reds. Everything on the farm is geared towards the animal’s welfare and they actively encourage natural methods to rear these mighty farm stock. What started of as a simple hobby back in 1998, when they brought two pedigree cows has now grown into an obsession - they have over 50 breeding cows and all their progeny! 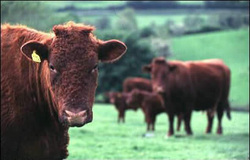 Red Ruby Devon cattle are a native breed to the British Isles and are undoubtedly one of the oldest breeds of domesticated cattle in this country. Ruby Red Devons are a wonderful breed to work with, not only are they handsome cattle to look at with their rich dark red coats, but they are extremely placid in nature, easy calvers and wonderful natural mothers. Please feel free to browse this website, although simple in its format the message is still the same; David and Sarah provide locally produced meat of high quality and at competitive prices, a nicer couple you could not hope to meet. We hope you enjoy the site any comments or questions please contact us at the Contact Page. Many thanks.